With Counter Strike Server Status you can inspect any Half Life servers (any mod: Counter Strike, Source, Day of Defeat, Condition Zero, etc) for various informations. You can get informations like server mod, max players, protocol version, server type, latency, operating system and if the server is password protected. 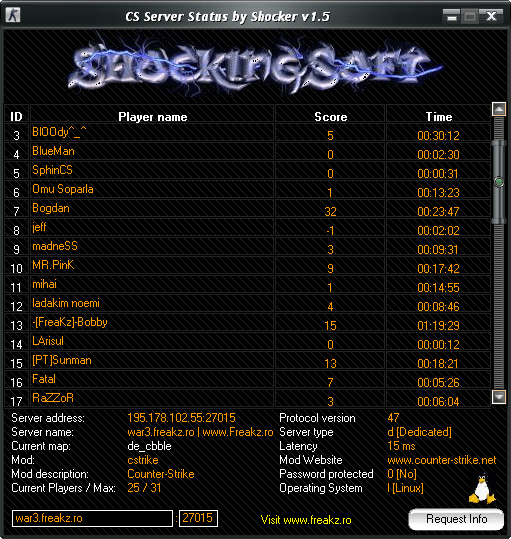 You can also get a full list of the players online toghether with their score and play time. nima: hi , your software is really usefull but for educational purpose would you email me the source code please .i want to learn about loading jpg files and about udp protocol. otoman: the software looks very cool! SeaGer: imi da eroarea: Unknown Error, Server may be down! de ce? Madu: Shocker...nu imi spui te rog ce ai folosit ca sursa pt server statsul de pe freakz.ro? Rusty: that programa work on servers steam ?? ?